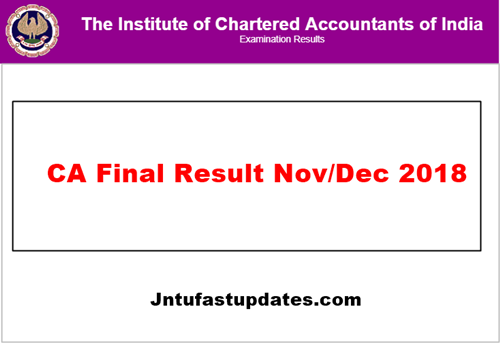 CA Final Results 2019 : ICAI Will be released the CA Final Exam Results November 2018 on 23rd January 2019 around 6PM. Students need to visit the following website to check their result at http://icai.nic.in. Arrangements have also been made for the students of Final Examination and Common Proficiency Test (CPT) desirous of having results on their e-mail addresses to register their requests at the website i.e. icaiexam.icai.org from 23rd January 2019. All those registering their requests will be provided their results through e-mail on the e-mail addresses registered as above immediately after the declaration of the result. In addition to above, it may be noted that for accessing the result at the above mentioned website the student shall have to enter his registration no. or PIN no. alongwith his roll number. Further, facilities have been made for students of Final Examination and Common Proficiency Test (CPT) held in November/December 2017 desirous of knowing their results with marks on SMS. The service will be available through India Times. The result card of CA Final 2018 will only be available on registered accounts for qualified candidates. The candidates who will obtain a minimum of 70 % marks in the CA Final December exam 2018 will be issued with Pass with Distinction certificate. The Expected percentage this year is more compared to the previous year where around 1,32,007 aspirants has appeared for the examination. Also the expected percentage for the exam held in November 2017 in both the groups is also high. The exam was conducted in different locations by occupying 372 Centers. 93,262 aspirants has appeared for CPT exam which is conducted in December. Step 4: Click on How to register to get result on email to read the complete guidelines and follow the steps to get your result through email. In addition to above, it may be noted that for accessing the result at the above website i.e. icaiexam.icai.org the student shall have to enter his registration no. or PIN no. along with his roll number. Further, facilities have been made for students of Final Examination and Common Proficiency Test (CPT) held in December 2017 desirous of knowing their results with marks on SMS. The service will be available through India Times. ICAI CA Final Result of November 2018 will declare today which will also include the pass percentage. Aspirants can expect the results of CA and CPT on the same day. Aspirants can check their results in icaiexam.icai.org but not in icai.nic.in which is used to declare the results since last year. Aspirants can expect the results today around 2 PM, and there is a chance of expecting results before 2 PM as the estimated time is around 11.50 AM. Many aspirants gave attempt for the examination where the list of top 3 rank holders will be available officially at 3 PM and also with pass percentage details for the year. ICAI will also release the Merit list of candidates who will secure minimum 55% and above marks and up to the maximum of 50th Rank in case of Final Examination in accordance with the decision of the Examination Committee on all-India basis. Excellent. Wish her good luck for her bright future.